With my usual imperfect timing I arrived at the restaurant in Shepherds Bush just as Jon was leaving. No matter, I walked with him to The Empire, passed the already lengthy queue of people standing outside in the freezing weather and in through the stage door. Jon waved his pass and the security person's eyes came to rest on me. "Pass?" she demanded. "It's ok, he's with me" tried Jon. Not good enough. "Name?" she demanded again. A lady of few words, yet authoritative enough to show you that no arguing would be accepted. With a bit of help from production staffer Tim the magical AAA laminate came into my possession, allowing me access to all of those mysterious doors that are usually shut firmly in your face. Once in the dressing room Jon and I set about some pressing tasks, namely facebook scrabulous. Having missed dinner, Jon graciously raided the dressing room supplies for me. He presented me with two fun size Mars Bars, an orange and a drink (water of course, nothing but water). Who needs London restaurants anyway? So by now you've seen my choice of photos for the blog. There's no avoiding it, the subject of fancy dress has to be addressed. 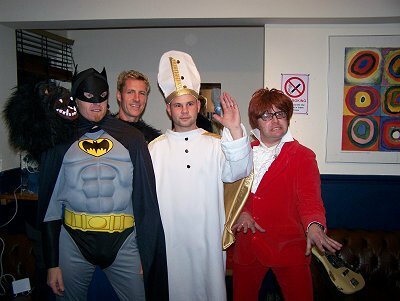 As each of the band members trickled into the dressing room, the subject of fancy dress was raised. More specifically, the lack of any sign of fancy dress in the queues of people waiting outside. I detected a few hints of "maybe this wasn't such a good idea after all" syndrome among the band. Too late to back out now they began to don their outfits. As you can see from the above dressing room photo, this was no half hearted dress-up. Rumour has it that Tim liked his Austin Powers outfit so much he actually bought it rather than hire it. Jon's hand gesture above was created after careful consideration. Deciding he really needed to know how to wave like the Pope, Jon carried out some detailed research on the subject, courtesy of Google (see below). 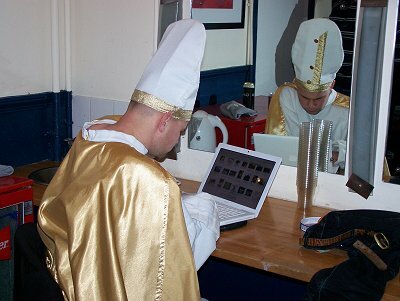 It's not often you see the Pope surfing the web. There were a few logistical problems to resolve with Batman's outfit, namely how to fit Stu's ear pieces inside his mask. Then there was poor Stew, destined to an evening drenched in sweat inside his Gorilla suit. It was about this time that Jon 'JB' Brown (head of Fierce) arrived in the dressing room, and took me aside for a long and interesting chat about what is going on in d: world. I'm not sure why I'm telling you this since I can't actually tell you anything he told me, but suffice to say some things are going to happen next year that you don't expect. Anyway, before long 'show time' had arrived. I'd meant to pop downstairs to catch part of the support set, but somehow the time had passed before I'd even realised, and now Delirious? were taking the walk down several flights of stairs to congregate in the wings of the stage. 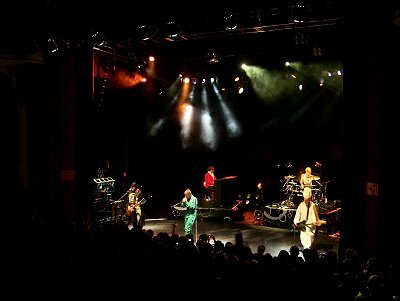 If there's one venue I know well it's Shepherds Bush Empire. This was my 10th time seeing Delirious? in the venue and with the help of my trusty AAA I was able to make use of the numerous, and now very familiar, corridors and doors that provide access from backstage to front of house, to stairwells and the balcony - providing a speedy route to any part of the venue. With my camera in hand I proceeded to tour the venue taking shots from every vantage point. I keep telling myself that one day I'll go to a Delirious? gig and actually sit in a seat for the entire show (it's never going to happen). 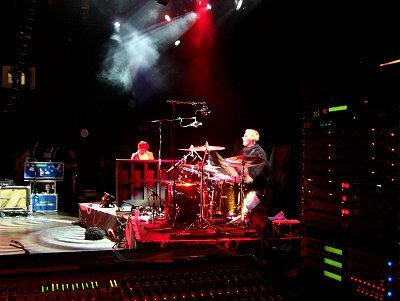 The above photo shows the view from Trevor's monitors desk at the side of stage. The guy works tirelessly through out the gig, with 5 different sound mixes to maintain - one specifically tailored to each band member. It's fascinating to watch. At any moment one of the guys on stage could signal to Trevor, often little more than a wave of hand to indicate that there's too much guitar in the mix, or not enough vocals. Trevor takes it all in his stride. Up in the balcony you get a great view of the stage with the crowd tightly packed in jumping together like a swarm of bobbing insects. SBE has several different balconies, getting progressively higher towards the ceiling, but even from the very top you still feel like you're in touching distance of the band on stage. There's just something supremely special and intimate about this venue, one of the many reasons it's my all time favourite music venue. Another privilege of having the right pass is that you get to 'do battle' in the photographers pit in front of the crowd barriers. Squeezed into the pit with several other camera wielding people and numerous security personnel is an interesting experience. 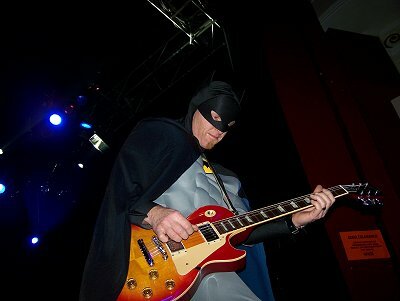 It does give the opportunity for some 'looking up the bands nostrils' shots though, and this one of Batman G playing guitar was a particular favourite of mine. 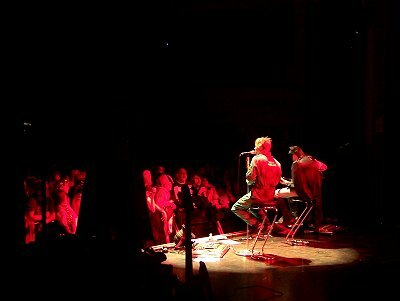 There was a part in the set where Martin and Stu sit alone on some stools in the middle of the stage. I watched this from the wings and was taken slightly by surprise as a large hairy creature came walking towards me. 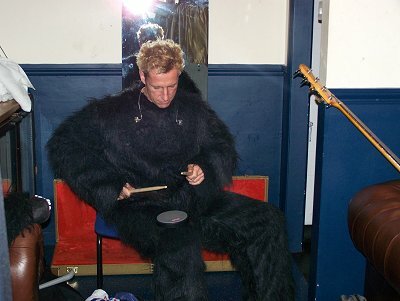 Stew had a 2-song break while Martin did some acoustic numbers so had decided to leave the relative discomfort of his drum set to strip out of the heat inducing Gorilla suit he was wearing. There was something slightly odd about talking to him mid-set. 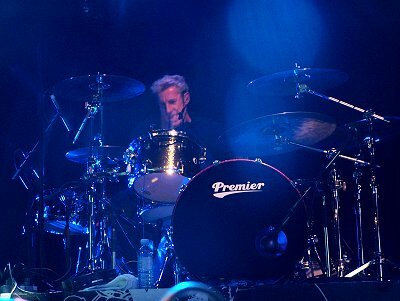 As Martin and Stu's 'Silent Night' ended, Stu also left the stage to stand with Jon and Stew in the wings while Martin performed a solo rendition of 'There Is An Angel'. Stu was desperately trying to persuade Jon to join him in some pantomime antics on stage to put Martin off, but I think they decided against it in the end. The show ended and we all returned to the dressing room where I had to make a hurried exit to catch a train home. My camera contained another 250 d: photos to sort through, of which 18 made the cut to this website. Hope everyone has a great Christmas - see you in 2008.